Boutique kids clothing world is ever-changing. New trends emerge and fade away, brands come and go. That's why here at My Little Jules boutique we are continuously searching high and low for the latest and greatest in kids fashion. Today, we would like to present to you one of our newest and favorite brands this spring, ZozoBugBaby. Zozobugbaby girl clothing, sometimes referred to as Zozo Bug Baby, is a cheerful, unique boutique girls clothing brand for parents and girls who love color and fun. ZozoBugBaby creates upbeat boutique children's clothing that can be easily distinguished by playful, unexpected combinations of fabrics, patterns and colors. Playful dresses, funky tops and striking skirts from ZozoBugbaby are sure to put a smile on your and your little diva's faces and make heads turn as she strolls down the street or makes her appearance at an event. In addition to some of the more available styles, like the Carousel Girl Dress, My Little Jules boutique carries one-of-a-kind ZozoBugBaby Boho Skirts featured on the cover of Baby & Children's Product News Magazine. Each one of these eccentric skirts are unique and will make a striking photo outfit. 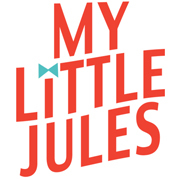 Don't forget that My Little Jules boutique offers a 10% discount to all first-time customers with coupon code WELCOME. In addition, all orders of $69 and up ship for free in the U.S., Canada and Puerto Rico . I LOVE this company, (yes I rep for them, I'm biased but still)! My daughter says, "mommy they are mismatched, but fashionably awesome!" My daughter LOVES the pieces!! LOVES them to death! Hoping to snag a few in her size!!! !